Hey guys, welcome back! I hope you are all having a good day. Today I have a fun swatch post and video for you! I recently got the opportunity to swatch/review some polishes from Dimension Nails so that is what today is all about! If you haven't heard of them they are a neat polish company. All of the polishes are 10 Free, Vegan, and Cruelty Free! Not only do they have polish but they also carry stamping supplies, 3D nail accessories and stickers. 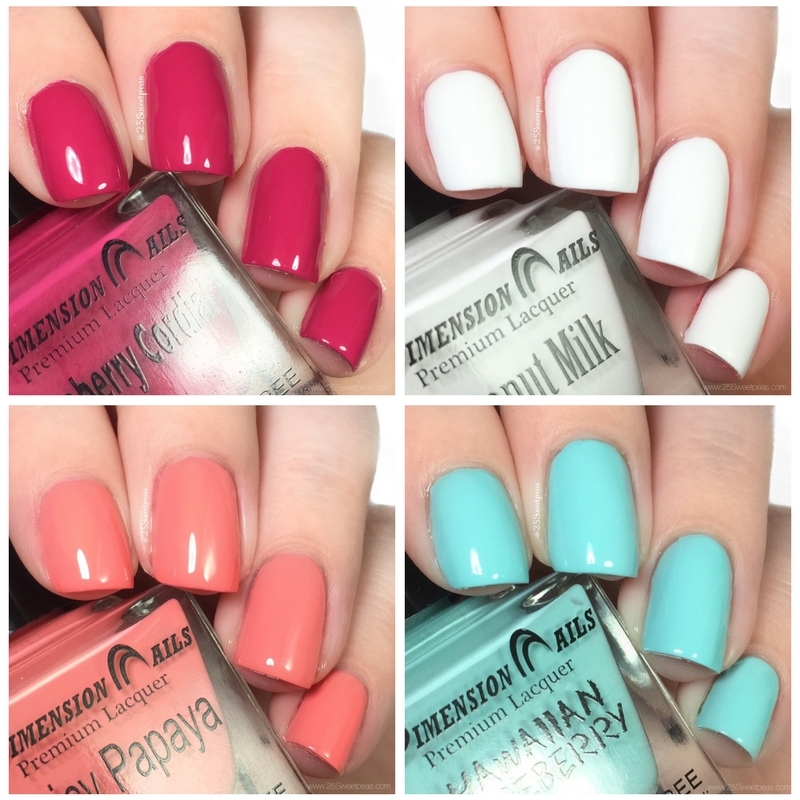 Today I am going to be sharing 4 of their polishes! Now a neat thing about there polish is what they are all created by different people so I will talk more about that in the polish bit so lets go! I love the overall color of this one but the formula on this one was a bit tricky which I think you can see in the video. It took be about 3 coats to get to full coverage and to have no patch bits. I feel like its so close to being a 2 coater but I almost feel like the brush is a bit to stiff to get a smooth second coat. This was a nice white! It was a tad bit thin in one coat so I felt like I needed a second coat if I was wearing it as a white. If I was wearing it as a base for art though one coat would most often be enough for say a gradation, or something with a lot of detail! I love this minty color that pulls a tad bit more blue! Its really pretty! This one built up perfectly in just 2 coats and looked really nice on! I think this may of been my favorite one of the bunch! Its a lovely berry toned color and it was the best formula out of all of them. This one you can easily get away with one coat however you can add a second to deepen the color or just if you like that fuller feel. Either way I was impressed! Overall I was impressed withe these! I feel like these formulas would be great for gradations and maybe even marbles? Ha, I may have to play with those ideas and report back! I hope you all have found this post informative! Have you all used any of Dimension's product before? Let me know in the comment! Also be sure to follow along with all of the latest Dimension related things on their social media channels below! Also I have used Raspberry Cordial for a cute quick little Mani! Check it out below! Those cremes look lovely - nicely thick and glazed. Always good to hear of new polish brands! Right! I would totally agree! Vegan polishes are becoming much more common which is great! Great names, you know what you are getting. Raspberry looks the fullest and richest of all. Cute colors with adorable names to match! Agreed! The names are fun! One coat white for art?!? Yessssssss! I'm good with one coat for art for sure! If I were wearing it alone I would still wear two coats! Juicy Papaya is gorgeous! I love that shade of coral. Its a great coral shade! I love the tropical-ish names! Nice polishes, this brand is new to me! Me too! Anything like that has my attention! Another brand I've never heard of before! I love that they're 10-free! 10 free is hard to find so its great! Agreed! Perfect go to shades!